Please Contact the webmaster if you have a picture of any of these teams! 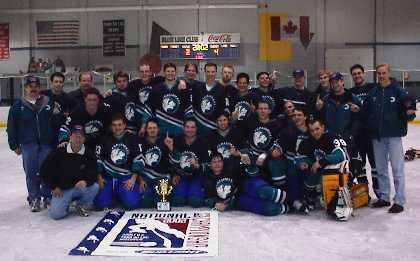 Champs of the 1st Pro Hockey League! Please Contact the webmaster if you have names of these players! 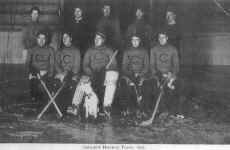 The USHL Copper Country Chiefs played three seasons at the Calumet Armory and MTU. 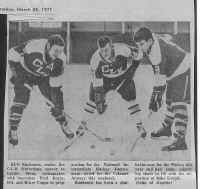 In those days, the USHL was a semi pro league. Seated L-R: Bruce Coppo, Mike Verbanac, Lon Lytikainen, Tom Greenleaf, Gary Franz, Terry Koskela. Middle L-R: Ken Ruohonen -Coach, Jeff Parrish, Roger Macomber, Mike Soumis, George Lyle, Jeff Baumgartner, Leo Durocher, Mike Finnegan, Tom Houle, Scurb Durocher. Back Row L-R: Gordie Coombs, Ron Woodhouse, Rich Riipi, Stan Stempkowski, Brian Eloschuck, Brian Butlin, Len Hercun. If you have a better copy of this picture, please contact webmaster. 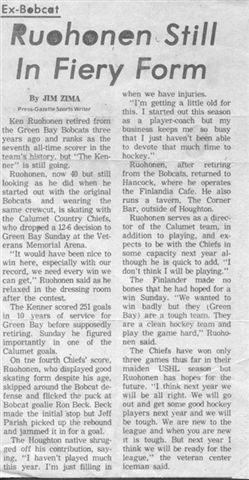 The CC Chiefs withdrew from the League Dec 1975 due to financial problems. Back Row L-R: Ray Pomroy -GM, Roger Rintala -Coach, Joel Issacson, Nick Rilie, Kurt Maki, Tom Halonen, J. Daavatila, B. Killinen, Andre Durocher, Bruce Coppo, Jr.
Middle Row L-R: Justin Juntilla, Derek Povich, Greg Murphy, Kurt Porter, Mark Pomroy, Joe Goullete, Bill Pelli, Bruce "Cukie" Coppo Sr. -Coach. Front Row L-R: Mike Bedore, Brian Miller, Brendan Doud, Jake Juntilla, Bob Williams. Laying Down L-R: Jake Juntilla. Ray Pomroy was the General Manager of the team for years, he passed away two weeks before the National Tourney, "we always said we were going to win it for him." 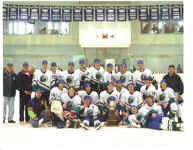 CALUMET — The Calumet Wolverines snapped a five-year span without the Gibson Cup, taking home the trophy for the first time since the 1995-96 season with a 7-4 senior hockey decision over the Portage Lake Pioneers at the Calumet Armor here Thursday. The Gibson Cup is a best-of-three series, with the Wolverines having picked up the first win over the Pioneers in Houghton a few weeks ago. The Cup-clinching win marks another point in a remarkable year for the Wolverines, having already sealed up the Great Lakes Hockey Conference regular season title. Leading the Wolverines in the championship win was center Mark Pomroy, who picked up a hat trick and added an assist. Portage Lake quieted the crowd early in the first period with a score from Kent Holombo as the Calumet cage minder Jason Moilanan went to the back of the net to clear a puck and was out of position to make a save. Holombo was assisted by Randy Stevens. Calumet knotted the score at 1-1 with a score from Brendan Doud, assisted by Brad Wickstrom and Pomroy. The Pioneers other score of the first period was by Stevens, assisted by Holombo and Josh Koskela. Down 2-1 the Calumet team seemed to be surprised by the fiery efforts of the Portage squad. Pomroy tied the game at 2-2 on a powerful slap shot wound from the wrist that sailed into the upper stick side corner of the Pioneer net, past reaching goalie Jeff Markham. Pomroy was assisted on the score by Brendan Doud and Jake Junttila. The Wolverines followed the score just 27 seconds later with another tally after a massive forecheck that allowed Bill Pelli to find the right side twine high and give the Wolves a 3-2 lead. Pelli was assisted by Kris Mihelcick. Please Contact the webmaster if you have a picture of this team or names of these players! 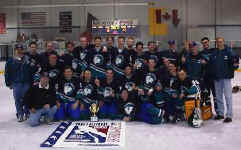 2nd Place in the Northern Div of Great Lakes Hockey League. Season Results: 9-11 regular season, 1-2 in the Nationals. Season Results: x-x-x regular season, x-x in the Nationals. Please contact webmaster if you can id the players on this team! HOUGHTON — The Calumet Wolverines and Portage Lake Pioneers finished up their respective seasons at nationals in Fond du Lac, Wis., over the weekend. Neither team was able to advance — the Pioneers went 0-2-1 with a 5-5 tie against Mosinee, and the Wolverines went 1-2, beating Minneapolis 6-4 in the opening game of the tournament. 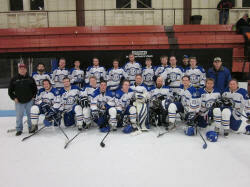 In regular season play, the Pioneers shared the title in the Northern Division of the Great Lakes Hockey League with a 15-5 mark. The Wolverines finished at 9-11 and in second in the Northern Division behind the Pioneers. As in past seasons, each team had to deal with the loss of players from the previous season. The Wolverines especially had to deal with a high turnover ratio this season. “We were very young this year,” Calumet forward Bruce Coppo Jr. said. Despite the disappointment at nationals this year, Pioneers’ forward Craig Biekkola thought that the team had a good year. Back row L-Rt: Roger Rintala -Asst coach, Nick Patrick, Joel Isaacson, Nate Polzein, Bobby Wendall Richards, Bryan Karl, Bruce Coppo Jr., Matt Helmikangas, Bruce Coppo Sr -Coach. Middle Row L-R: 4 players: Darron Durocher, Darron Erkkila, Josh Treganowan, Andre Durocher. Kneeling in front L-R: Clever Heikkila -goalie, Mike Babcock (back), Brett Randell, Casey Peterson, Jeremy Maki, Ryan Patrick -goalie. Missing from photo: Josh Frantti, Phil Torala, Nick Borkowski, Jeff Rosseau, Mike Lowery, John Make. 1W 2L in the Nationals. Standing L-R: Bruce Coppo Sr -Coach, #4 Darron Durocher, #13 Ron Knoble, #17 Kyle Jarvi, #18 Nick Patrick, #6 Brian Lasanen, #19 Gust Junttila, #24 Kyle Isaacson, #20 Mike Babcock, Roger Rintala -Asst coach. Kneeling Front L-R: #2 Jeff Erkkila, #15 Wayne Hyrkas, #16 Corey Rastello, #29 Ryan Patrick (goalie), #3 Jake Junttila, #24 Lorn Randell, #23 Jeremy Maki, #9 Mike Lowery. xW xL in the Nationals. Back Row L-Rt: 1, 2, Kyle Isaacson, 4 (way back), 5, 6, 7, 8. 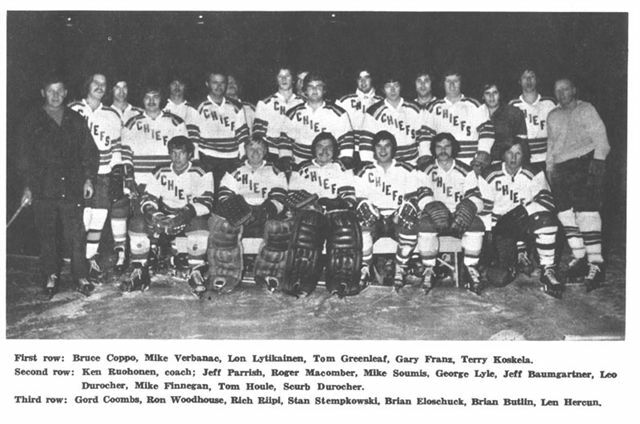 Middle Row L-Rt: Coach Bruce Coppo Sr, 2, 3, 4, Jeff Erkkila, 6, Mike Babcock, Asst Coach Roger Rintala. Kneeling L-Rt: 1, Ryan Patrick (goalie), 3, 4, 5, 6. Tim Viola, Evan Salmela, Kurt Porter, Adam Hillstrom, Bob Rangus. Coach Bruce Coppo, Eric Bausano, 3, 4, 5, 6, 7, 8, 9, 10, 11, 12 13.